Patients with ESRD commonly experience secondary hyperparathyroidism, a condition primarily managed with activated injectable vitamin D. The biologic effects of vitamin D, however, are widespread, and it is possible that activated injectable vitamin D alters survival in ESRD. This hypothesis was tested in a historical cohort study of incident hemodialysis patients who lived throughout the United States between January 1996 and December 1999. The primary outcome was 2-yr survival among those who survived for at least 90 d after initiation of chronic hemodialysis. During this period, 51,037 chronic hemodialysis patients survived for at least 90 d from the initiation of hemodialysis, and in the ensuing 2 yr, 37,173 received activated injectable vitamin D and 13,864 did not. At 2 yr, mortality rates were 13.8/100 person-years in the group that received injectable vitamin D compared with 28.6/100 person-years in the group that did not (P < 0.001). Cox proportional hazards analyses adjusting for several potential confounders and examining injectable vitamin D therapy as a time-dependent exposure suggested that compared with patients who did not receive injectable vitamin D, the 2-yr survival advantage associated with the group that did receive injectable vitamin D was 20% (hazard ratio, 0.80; 95% confidence interval, 0.76 to 0.83). The incidence of cardiovascular-related mortality was 7.6/100 person-years in the injectable vitamin D group, compared with 14.6/100 person-years in the non–vitamin D group (P < 0.001). The benefit of injectable vitamin D was evident in 48 of 49 strata examined, including those with low serum levels of intact parathyroid hormone and elevated levels of serum calcium and phosphorus, situations in which injectable vitamin D is often withheld. Repeating the entire analysis using marginal structural models to adjust for time-dependent confounding by indication yielded a survival advantage of 26% (hazard ratio, 0.74; 95% confidence interval, 0.71 to 0.79) associated with the injectable vitamin D group. In this historical cohort study, chronic hemodialysis patients in the group that received injectable vitamin D had a significant survival advantage over patients who did not. Randomized clinical trials would permit definitive conclusions. Vitamin D deficiency is a common medical condition (1), especially among patients with ESRD (2,3). In the kidney, 25-hydroxyvitamin D-1α-hydroxylase coverts 25 α-hydroxyvitamin D to 1,25-dihydroxyvitamin D, the active form of vitamin D. Among patients with renal failure, reduced synthesis of active vitamin D contributes to secondary hyperparathyroidism (4). Indeed, the primary indication for activated injectable vitamin D among patients with kidney disease is to suppress serum levels of parathyroid hormone (PTH) and to prevent skeletal complications (5). The biologic consequences of vitamin D receptor activation, however, extend well beyond the suppression of PTH synthesis. For example, activated vitamin D suppresses renin expression (6,7), modulates the immune and inflammatory system (8–10), triggers apoptosis (11,12), and promotes vascular endothelial health (13). Although vitamin D has been associated with improved survival in different settings, including cancer (14–16) and infection (17,18), no large study has examined the potential survival benefit of activated injectable vitamin D in a population with ESRD. We tested the hypothesis that therapy with any formulation of activated injectable vitamin D improves the survival of patients who have ESRD and undergo chronic hemodialysis. We performed a historical cohort study of incident chronic hemodialysis patients in the United States who initiated hemodialysis in any of >1000 dialysis facilities operated by Fresenius Medical Care (North America). The primary study population was all patients who initiated chronic hemodialysis between January 1, 1996, and December 31, 1999. Patients were followed until December 31, 2002, or until they were lost to follow-up. This study was approved by the Institutional Review Board of the Massachusetts General Hospital. The study data were collected prospectively and entered into a central database, and no additional data were abstracted retrospectively from medical records. Upon a patient’s admission to a dialysis facility, demographic information including age, gender, race, date of first dialysis, primary cause of renal failure, and diabetes status was recorded. All laboratory tests were performed in a centralized laboratory (Spectra Laboratories, Rockleigh, NJ), and results were automatically downloaded to the Fresenius Medical Care-NA database. Hemodialysis prescription, laboratory tests, hospitalization, detailed records of medications administered during each hemodialysis session, and mortality information were also collected. Records of injectable vitamin D administered during each hemodialysis session and mortality data undergo routine quality assessment and control measures because of their intrinsic link with billing systems. During the study period, patients received activated injectable vitamin D (calcitriol, 1,25-[OH]2D3, Calcijex, Abbott Laboratories, Abbott Park, IL, or paricalcitol, 19-nor-1,25-[OH]2D2, Zemplar, Abbott Laboratories). Whereas patients may have received other formulations of injectable vitamin D (e.g., doxercalciferol, 1α-[OH]-D2, Hectorol, Bone Care International Inc., Middleton, WI), paricalcitol and calcitriol (henceforth referred to as “injectable vitamin D”) accounted for >95% of all injectable vitamin D used during the study period. Between 1999 and 2002, Fresenius Medical Care distributed management guidelines to target intact PTH levels to ≤300 pg/ml, and in January 2002, recommendations were to target calcium-phosphorus product to <55. Specific therapies to achieve these goals were not suggested, no policy was in place to require physicians to use injectable vitamin D, and clinical data had not suggested a survival benefit during dialysis with injectable vitamin D.
At each hemodialysis session, detailed records of medications administered (name, date, and route of administration) are collected. Missed hemodialysis treatments, whether expected (e.g., hospitalization) or unexpected (e.g., noncompliance), and all permanent discharges (e.g., transplantation, voluntary withdrawal from therapy, transfer to a non-Fresenius hemodialysis unit, loss to follow-up, death) are recorded in the database. A temporary absence or permanent discharge must be recorded in the system by the facility staff to complete the daily reconciliation of prescribed versus administered treatments. Therefore, all patient deaths, including date and cause of death (International Classification of Diseases, Ninth Revision code), are recorded in the database by the individual facilities as one type of permanent discharge. In addition, policy at Fresenius mandated that all hospitalizations be recorded as temporary absences, even when no dialysis treatment was missed. Data that are entered by the individual facilities undergo continuous quality assessment to ensure their accuracy and completeness. During the entire study period, 37,173 (72.8%) of 51,037 received injectable vitamin D. Seventy-three percent of those who were eventually treated with injectable vitamin D had started within 90 d of initiating chronic hemodialysis, 83% had started within 180 d, and 93% had started within 365 d. Therefore, initiation of injectable vitamin D was time dependent, and hence this exposure was examined as a time-dependent variable in all analyses. In this manner, if a patient initiated vitamin D treatment 1 yr after initiating dialysis, then the 1-yr survival before therapy was credited to the untreated group and only thereafter was subsequent survival time credited to the vitamin D group. Furthermore, once a patient initiated injectable vitamin D, the patient conservatively stayed in that group for all further analysis regardless of the number of doses of injectable vitamin D received and regardless of any consequences to serum calcium and phosphorus that may have resulted from vitamin D administration. The primary analysis examined the 2-yr survival of patients who survived for at least 90 d after initiating chronic hemodialysis. Survival estimates reported by the United States Renal Data System registry typically exclude patients who die within the first 90 d of initiating hemodialysis (19); thus, our primary analysis provided survival estimates that could be compared directly with estimates obtained from the US dialysis registry. To examine the potential impact of this analytic choice, we also performed several sensitivity analyses that examined the 2-yr survival from 0, 180, and 365 d after initiating hemodialysis. Our primary analysis used Cox proportional-hazards regression to estimate mortality rate (hazard) ratios for vitamin D use versus nonuse. Patients contributed person-time until they underwent kidney transplantation, voluntarily withdrew from chronic hemodialysis, transferred to a non-Fresenius facility, or reached the end of the follow-up period, whichever occurred first. Stratum-specific hazard ratios (HR) were examined to test for effect modification. The Cox model included the following baseline variables: Baseline age, gender, race (white, black, or other), history of diabetes, arteriovenous access (fistula, graft, or catheter), predialysis systolic BP, body mass index, blood levels of albumin, white blood cell count, hemoglobin, ferritin, bicarbonate, creatinine, urea reduction ratio (100 × [1 − postdialysis blood urea nitrogen/predialysis blood urea nitrogen]), hospitalizations, and standardized mortality rate (each year between 1996 and 2002) of the dialysis facility (20,21). Standardized mortality rate is a facility-specific mortality rate relative to all Fresenius Medical Care dialysis facilities throughout the United States and adjusts for between-center variations in survival that are beyond typical explanatory variables such as differences in age, gender, race, nutrition status, and measures of dialysis adequacy (22). Serum levels of calcium, phosphorus, and intact PTH (the last measured by the Nichols Advantage Chemiluminescence assay that detects amino acids 7 to 84) were included in the Cox model as time-dependent variables. Values of serum calcium, phosphorus, and PTH reflected baseline levels for patients who never received injectable vitamin D, whereas for patients who were treated, the calcium, phosphorus, and PTH levels included in the model were those that immediately preceded and thus were linked to the decision to initiate therapy. Baseline laboratory values were obtained from the mean of all values within 3 mo of the start of follow-up when follow-up started 90 d after hemodialysis initiation and the mean of all values for the immediate 3 mo before when follow-up started 180 or 365 d after hemodialysis initiation. In this manner, laboratory values in the non–vitamin D group were also updated. Study entry period, defined as the calendar year when a patient entered this study, was included as a measure of unknown confounding related to improvements in clinical practice over time. Serum levels of calcium, phosphorus, and PTH are risk factors for mortality that potentially influence the decision to start injectable vitamin D, and initiation of injectable vitamin D may affect subsequent mineral and PTH levels. Standard methods to adjust for these potential time-dependent confounders (e.g., the time-dependent Cox model used in our primary analysis) may lead to biased estimates of a therapeutic agent such as vitamin D (23). Therefore, we conducted a second independent analysis that adjusted for the time-dependent (updated monthly) levels of minerals and PTH by inverse probability weighting, i.e., we fit a Cox model in which each patient’s contribution was weighted by the inverse of his or her probability of receiving vitamin D at each time, as described previously (24). Technically, the parameters of the resulting weighted Cox model estimate the parameters of a marginal structural model. To estimate the weights, we used the same baseline and time-dependent variables described for the primary analysis, except that baseline variables were measured at the start of follow-up. Follow-up for the weighted Cox model started at the first time that serum calcium, phosphorus, and PTH levels were available and not at 90 d after the initiation of dialysis as in our primary analysis. As a result of coding the time-dependent vitamin D variable (once treated, always treated) and under the assumption of no unmeasured confounding, the HR estimated from the marginal structural model can be viewed as the observational analog of the intent-to-treat HR estimate from a randomized trial of vitamin D (25). To assess the potential influence of the “excellent medical center” effect that may not have been captured by adjustment for the standardized mortality rates (26), we also performed matched analyses. Patients who received injectable vitamin D were matched to patients who did not in a ratio of 1:1 within the same facility by random selection using the “nearest available” matching algorithm (27). The randomly sampled patients were used to form two new comparison groups with or without vitamin D treatment, each facility contributing an equal number of patients to the two groups. The general characteristics and the survival outcomes of patients were compared between the two sampled groups using the same method as above for the general populations. Additional matching analyses were also conducted to consider other potential confounding factors (age, gender, race, diabetes, weight, and albumin) as matching layers in addition to the matching of facility identity. Although this analysis potentially addressed the issue of an “excellent center” effect, it did not account for the possibility of an “excellent doctor” effect. Because of the time-dependent nature of these analyses, traditional propensity score analysis could not be performed (28). Nonetheless, our second analysis using marginal structural models was weighted by a function of the propensity to receive injectable vitamin D (see above). In addition, because this was an observational study in which initiation of injectable vitamin D was time dependent, an intent-to-treat analysis based on exposure during the first month of hemodialysis, for example, would have grossly misclassified patients’ exposure status (29). Furthermore, such an analysis would not have accounted for the probability of receiving injectable vitamin D on the basis of previous levels of minerals and PTH, a challenge addressed in standard clinical trials by strict entry criteria and randomization, and a problem that we addressed with the marginal structural models. Between January 1996 and December 1999, 64,151 patients initiated chronic hemodialysis in a US-based Fresenius dialysis facility. Of these patients, 13,114 (20%) were excluded because they did not continue hemodialysis after 90 d from the first date of initiating chronic hemodialysis. The primary reasons for not reaching 90 d after initiation of hemodialysis and thus exclusion were death (46%), transfer to a non-Fresenius facility (including hospitals, nursing homes, and extended care facilities [24%]; recovery of renal function [15%]; voluntary withdrawal from therapy [13%]; and renal transplantation [2%]). The study population therefore consisted of 51,037 patients who survived and remained on hemodialysis for at least 90 d from the initiation of therapy. Baseline characteristics comparing the group that subsequently received injectable vitamin D (n = 37,173) with those who did not (n = 13,864) are shown in Table 1. Unlike serum levels of PTH, serum levels of calcium and phosphorus did not seem to differ clinically between those who did and did not receive injectable vitamin D. These results were supported when these minerals were examined further (median serum calcium, 8.65 mg/dl [interquartile range (IQR), 8.2 to 9.0] versus 8.60 mg/dl [IQR, 8.2 to 9.1], respectively; median serum phosphorus, 5.10 mg/dl [IQR, 4.4 to 6.2] versus 5.20 mg/dl [IQR, 4.2 to 6.1], respectively). Diabetes status did not differ markedly between the two groups. In contrast, those who received vitamin D injections were more likely to be black and have hypertension as their primary cause of renal failure. In the ensuing 2 yr, parathyroidectomy rates differed such that 0.15% of patients who received injectable vitamin D underwent a parathyroidectomy, compared with 0.07% of patients who did not (P < 0.001). Two-year survival was 75.6% in the group that received injectable vitamin D, compared with 58.7% in the group that never did (log rank P < 0.001). Corresponding mortality rates were 13.8 per 100 person-years and 28.6 per 100 person years, respectively (P < 0.001). After adjustment for potential confounders, our primary analysis revealed that patients who received any form of injectable vitamin D had a 20% (HR, 0.80; 95% confidence interval [CI], 0.76 to 0.83) lower mortality compared with patients who never received injectable vitamin D (Table 2). Marginal structural analysis estimated a 26% lower mortality rate (HR, 0.74; 95% CI, 0.71, 0.79) in those who received injectable vitamin D compared with those who did not. Further adjustment for serum albumin and creatinine levels, urea reduction ratios, and hospitalization status all updated each month did not materially change the results (HR, 0.73; 95% CI, 0.69 to 0.77). During the ensuing 2 yr, patients who received injectable vitamin D received a mean of 117 doses (median, 99 doses; IQR, 39 to 185 doses) of this therapy and underwent a mean of 222 ± 101 hemodialysis sessions. Notably, the time between the first and last injections of vitamin D was 460 ± 269 d (median, 533 d; IQR, 189 to 731 d), and <5% of treated patients received this therapy for <30 d once they were started. Cardiovascular-related mortality rates were 7.6 per 100 person-years in the injectable vitamin D group, compared with 14.6 per 100 person-years in the non–vitamin D group (P < 0.001), and rates for infectious causes of death were 1.1 and 2.8 per 100 person-years, respectively (P < 0.001). We then performed a series of additional analyses to explore the sensitivity of our primary result. First, we examined 2-yr survival from the initiation of chronic hemodialysis (rather than after 90 d from the initiation) and found that the survival advantage in the group that received any form of injectable vitamin D was 27% (multivariable adjusted HR, 0.73; 95% CI, 0.69 to 0.76). This result was similar to that obtained in our marginal structural analysis that started from the first measurement of serum calcium, phosphorus, and PTH (see above). We then restricted the analyses only to those who survived for at least 180 d (n = 46,135) and found a survival advantage of 25% (multivariable adjusted HR, 0.75; 95% CI, 0.71 to 0.78) in the group that received vitamin D. A similar analysis restricted to those who survived for at least 365 d (n = 38,998) yielded a 33% (multivariable adjusted HR, 0.67; 95% CI, 0.67 to 0.70) survival advantage of vitamin D therapy. In these latter analyses, laboratory values were updated to reflect the 3 mo before 180 and 365 d, respectively, for the non–vitamin D group and to reflect the levels at the time of starting vitamin D in the vitamin D group. In the follow-up period, voluntary withdrawal from chronic hemodialysis was less common in the injectable vitamin D group (4.0%) than in the non–vitamin D group (7.0%; P < 0.001). Patients who were lost to follow-up or those who transferred to a non-Fresenius facility and thus whose precise outcome during the study period was uncertain also differed between the two groups (6.9% in the vitamin D group versus 11.6% in the non–vitamin D group; P < 0.001). Given the possibility that differences in loss to follow-up and voluntary withdrawal may have contributed to our results and despite our efforts to adjust for covariates that may have affected censoring times, we examined patients who were lost to follow-up and those who voluntarily withdrew from dialysis under extreme assumptions. First, all of these individuals were categorized as having immediately died at the time of censoring. Repeating the entire multivariate analysis under this assumption yielded a survival advantage of 21% (HR, 0.79; 95% CI, 0.76 to 0.83) associated with the group that received injectable vitamin D compared with those who did not. Second, we assigned the censoring time for all patients who were lost to follow-up to 2 yr or the longest event-free time possible. Therefore, patients who were lost to follow-up in the non–vitamin D group and may have died shortly after leaving a Fresenius facility were given the maximum survival time. In this analysis, the survival advantage for the group that received injectable vitamin D was 16% (HR, 0.84; 95% CI, 0.80 to 0.88). Therefore, the 2-yr survival advantage associated with the injectable vitamin D group seemed to lie between the upper (0.88) and lower (0.76) bounds of these CI, or conservatively between 12 and 24%. Certain baseline characteristics differed between the two groups (Table 1). For example, the mean age of patients who initiated injectable vitamin D was 2 yr younger than the patients who did not, and the mean serum albumin level was slightly higher in the injectable vitamin D group. 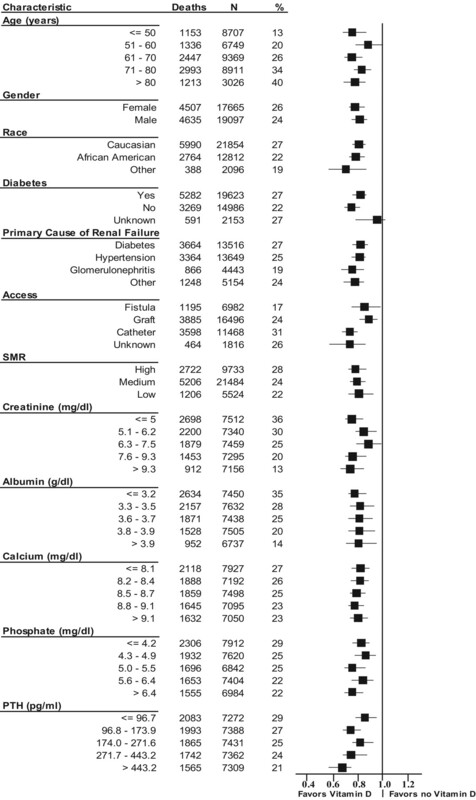 Moreover, other baseline characteristics such as greater frequency of women, blacks, and fistula for vascular access; higher body mass index, serum creatinine, and urea reduction ratios; and lower white blood cell counts tended to favor those who initiated injectable vitamin D. Although we adjusted for these covariates in the multivariable analyses (Table 2), to further mitigate the effect of baseline differences to explain these results, we performed stratified analyses (Figure 1). Within each level of the stratified variables, the analysis was multivariable adjusted for all potential confounders included in the final model of Table 2. In 48 of 49 strata, there seemed to be a survival advantage in the group that received injectable vitamin D, including the stratum of patients with the highest levels of serum calcium (quintile 5: >9.1 mg/dl [>2.27 mmol/L]) and phosphorus (quintile 5: >6.4 mg/dl [> 2.07 mmol/L]), and the lowest levels of intact PTH (quintile 1: <96.7 pg/ml [< 10.6 pmol/L]). In addition, the survival advantage seemed to strengthen with increasing serum levels of PTH. These same strata of elevated calcium, elevated phosphorus, and low PTH were also examined using marginal structural models given the potential for confounding by indication in these specific subgroups. In these latter analyses, the survival advantage associated with the injectable vitamin D group remained similar to estimates obtained from the Cox models (quintile 5 of calcium: HR, 0.72; 95% CI, 0.64 to 0.81; quintile 5 of phosphorus: HR, 0.75; 95% CI, 0.64 to 0.83; quintile 1 of PTH: HR, 0.78; 95% CI, 0.71 to 0.87; and in the stratum of Ca × P >55: HR, 0.71; 95% CI, 0.63 to 0.80). Hazard ratios (HR) for mortality associated with injectable vitamin D treatment stratified by exposure characteristic. Each result reflects a multivariable adjusted model (see final model in Table 2 for covariates). Percentage represents fraction of deaths within each stratum, boxes represent point estimates, and horizontal lines represent 95% confidence intervals. Reference category for each analysis is the corresponding group that did not receive injectable vitamin D. See Table 1 for SI conversions. SMR, standardized mortality rate. In the overall multivariate model and within each multivariable adjusted stratified model, in addition to other covariates including hemoglobin and serum albumin levels, serum levels of calcium, phosphorus, and PTH were independently associated with survival along with injectable vitamin D. We therefore examined the association between these measures (quintiles) and mortality according to vitamin D injection status. In these analyses, nine (n − 1) treatment × quintile covariates were included (Figure 2). Elevated serum levels of calcium, phosphorus, and intact PTH were associated with increased mortality compared with patients at lower levels, but within each quintile, the mortality risk among patients who received injectable vitamin D was lower than in patients who did not. 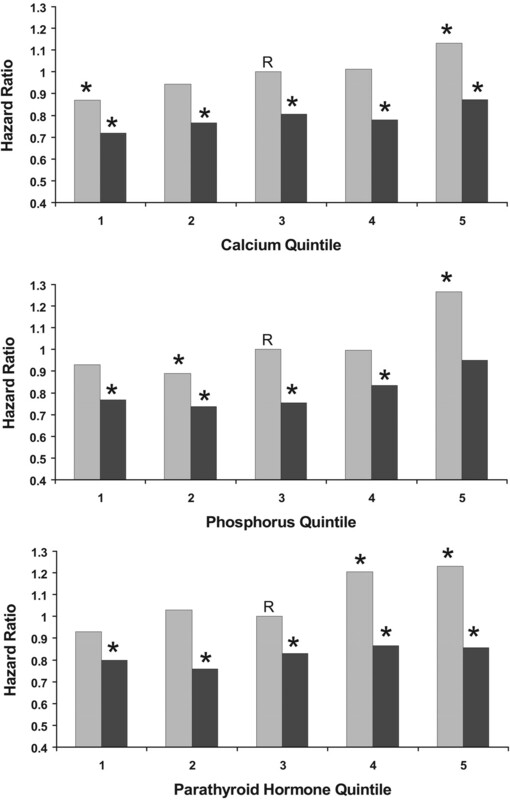 HR for mortality according to baseline quintiles of serum calcium, phosphorus, and intact parathyroid hormone. Dark bars represent the effect of receiving injectable vitamin D, and light bars represent the effect of not receiving injectable vitamin D. R, reference category. *P < 0.05. See Figure 1 for quintile categories. We also performed analyses stratified by thresholds outlined in current guidelines released well after the current study period (5). The recommended threshold to start injectable vitamin D is a serum level of intact PTH >300 pg/ml (>33.0 pmol/L); therefore, we examined the specific strata of patients with baseline serum levels <300 pg/ml (<33.0 pmol/L). In this subgroup (n = 28,255; 55% of the total population), the survival advantage for the injectable vitamin D group was 18% (HR, 0.82; 95% CI, 0.77 to 0.86). The recommended threshold to stop vitamin D is a serum level of intact PTH <150 pg/ml (<16.5 pmol/L). In this stratum (n = 15,067), the survival advantage associated with the group that received injectable vitamin D was 21% (HR, 0.79; 95% CI, 0.74 to 0.85) compared with the group that did not. Of note, when the number of administrations of injectable vitamin D was examined by serum levels of PTH, patients with baseline levels <150 pg/ml received 92 ± 81 injections over 224 ± 99 dialysis sessions (approximately 41%), patients with levels between 150 and 300 pg/ml received 114 ± 86 injections over 222 ± 101 dialysis sessions (approximately 51%), and patients with levels >300 pg/ml received 136 ± 89 injections over 225 ± 100 dialysis sessions (approximately 60%). Recommendations to stop vitamin D also include serum calcium levels >10.2 mg/dl (>2.54 mmol/L) or serum phosphorus levels >6.0 mg/dl (>1.94 mmol/L) (5), and when the strata of patients with baseline mineral levels above these thresholds were examined, the survival advantage associated with the injectable vitamin D group was 24% (n = 879; HR, 0.76; 95% CI, 0.54 to 1.08) and 19% (n = 13,241; HR, 0.81; 95% CI, 0.74 to 0.89), respectively. Marginal structural analyses of these same strata revealed similar results (data not shown). Finally, we performed an analysis matching patients who received injectable vitamin D with a random sampling of patients who did not within each facility to mitigate the “excellent center effect” that may have explained the results above. Each facility contributed equal numbers of patients to the two resulting groups, and the results were adjusted for potential confounders detailed in Table 2. Even in this analysis, patients who received injectable vitamin D experienced improved survival compared with the patients who did not (Table 3). In samples with additional matching on the basis of age, gender, race, diabetes status, weight, and albumin, results did not substantially change (Table 3). In this historical cohort study, incident chronic hemodialysis patients in the group that was treated with activated injectable vitamin D had a significant survival advantage over a comparable group of chronic hemodialysis patients who did not. These findings withstood adjustment for multiple confounders, several sensitivity analyses, stratified models, and an independent analysis to address the issues of confounding by indication and confounding by mineral levels that may have resulted from injectable vitamin D. Because injectable vitamin D use among chronic hemodialysis patients was not universal, we were able to examine the association between receiving injectable vitamin D and mortality in 49 multivariate strata, and in 48 of 49 strata, the benefits were significant. We suggested previously that chronic hemodialysis patients who are treated with paricalcitol, a specific injectable vitamin D analog with less calcemic and phosphatemic properties, have a significant survival advantage over patients who are treated with calcitriol, the standard injectable vitamin D used worldwide (22). In this historical cohort study, we extend these previous findings to a more fundamental question of whether chronic hemodialysis patients who receive any form of injectable vitamin D have a survival advantage over comparable patients who do not. Activated vitamin D binds the vitamin D receptor, which is known to be present in several cell types (21). Once bound, the vitamin D–receptor complex enters the cell nucleus and binds the retinoid X receptor, and this complex subsequently binds sequences on the promoter region of specific genes to alter gene expression (30). Although many have studied the classical effects of vitamin D receptor activation, including suppression of PTH synthesis and increased intestinal calcium and phosphorus absorption (2,31–33), data on the “nonclassical” actions of vitamin D are equally abundant. In vitro, vitamin D inhibits proliferation of colon and prostate cancer and leukemia cell lines (15,34–36). Vitamin D receptor knockout animals exhibit severe gastrointestinal inflammation (37), abnormal T lymphocyte response (38), altered expression of genes that regulate cell adhesion and metabolism (39), and proliferation of colon cancer cells (36). Vitamin D–deficient animals exhibit poor glucose-induced insulin secretion (40), and clinically, vitamin D deficiency has been linked to type 1 diabetes (41), hypertension (42), coronary artery disease (43), and colon cancer (44). Relevant to those with ESRD, vitamin D deficiency has also been associated with alterations in the immune and inflammatory systems (8–10); activation of the renin-angiotensin system (6,7); and alterations in vascular growth factors (13), symptoms of heart failure (45), and left ventricular hypertrophy (46). Some (47) but not all (48) studies suggest that there is an inverse relation between serum vitamin D levels and coronary calcification. Whether clinical symptoms and signs reverse with administration of injectable vitamin D or are prevented with early injectable vitamin D exposure is not clear; however, one or a combination of the mechanisms outlined above may be involved in explaining the results we observed. The association between therapy with vitamin D injections and survival among chronic hemodialysis patients has not been previously examined in detail. Although the nephrology community has largely used active vitamin D to lower serum levels of PTH (5), the vitamin D receptor is ubiquitous, and activation of this receptor has widespread effects (21). Although some have hypothesized a link between reduced active vitamin D synthesis and poor survival among patients with ESRD (49), only recently has an observational study of 242 chronic hemodialysis patients suggested a reduction of cardiovascular-related mortality among patients who receive vitamin D (50). The biology of vitamin D is tightly interwoven with the biology of serum calcium, phosphorus, and PTH, which themselves have an independent yet complex relationship with survival (51). Nevertheless, previous observational studies implicating alterations of serum calcium, phosphorus, or PTH as independent factors associated with mortality among chronic hemodialysis patients did not often account for whether patients were receiving injectable vitamin D, and whether vitamin D administration itself altered these associations (52,53). In contrast, the potential adverse consequences of vitamin D administration have been highlighted (54–57) and include alterations in serum minerals and the potential for arterial calcification. A survival advantage associated with the group that received injectable vitamin D was present in 48 of 49 strata examined, even after adjusting for other potential confounders within each stratum. Thus, although we did adjust for potential confounders in our primary analyses (Table 2), multivariable stratified analysis further mitigated the effect of residual confounding. For example, the results favored vitamin D therapy within patient groups with comparable levels of serum albumin, and even among patients with the lowest levels of PTH or the highest levels of serum calcium or phosphorus at the time of starting injectable vitamin D. The finding that vitamin D injections appeared to benefit these latter subgroups should be viewed in light of recent recommendations to withhold previously initiated vitamin D injections if serum levels of PTH are low or if serum calcium or phosphorus levels are elevated (5). In our previous study, we observed a benefit of paricalcitol over calcitriol that similarly crossed the entire spectrum of serum PTH or mineral levels (22); however, that study examined only vitamin D–treated patients. Our current data demonstrated that elevated serum calcium, phosphorus, and PTH levels were associated with increased risk for mortality, although at each level, mortality risk was lower among those who received injectable vitamin D compared with those who did not, suggesting that the effect of activated vitamin D extends beyond the classical mineral and PTH effects. This is especially important given the recent addition of alternative therapies to specifically manage elevated serum levels of PTH (58). Injectable vitamin D therapy is associated with decreased serum levels of PTH, which have been linked to adynamic bone disease (59,60), and increased calcium and phosphorus levels, which have been linked to excess coronary calcification (56,61), important intermediate outcomes that we were unable to examine. Thus, critical questions that remain if our data are confirmed include how to dose injectable vitamin D appropriately in patients with low levels of serum PTH or elevated levels of serum calcium and phosphorus, overcome the known resistance to vitamin D in uremia (62,63), and at the same time maximize the apparent survival benefit that we observed. Notably, injectable active vitamin D, similar to injectable erythropoietin and iron, is often given in supraphysiologic doses to patients who receive dialysis, and at least in animals, coronary calcification is induced by administration of supraphysiologic doses of vitamin D (64). The current study has several potential limitations. First, the possibility that unmeasured confounders (e.g., baseline comorbidities, nutritional status, concomitant treatments) or potential sources of bias explained our results cannot be completely excluded. Acknowledging this, however, the effect size of our primary result was relatively large, suggesting that only a significant imbalance of baseline characteristics between the two groups could have mitigated these results. In addition, the results withstood several sensitivity analyses incorporating extreme assumptions that biased the analysis toward the null (no effect of therapy), the effect size was robust when >40 strata were examined, and our analysis matched by facility revealed similar results. Importantly, we also obtained a similar estimate when the analysis was based on marginal structural models that account for time-dependent confounding. We acknowledge, however, that confounding and selection bias cannot be completely excluded through any statistical analysis, and one could argue that certain baseline differences (Table 1) favored the vitamin D–treated group. Second, we were unable to examine in detail the contribution of dose to our results. Absolute doses of the formulations used during the study period were different (22); therefore, any examination of absolute dose would have to specify which formulation a patient was receiving, whether patients switched formulations (22), and the precise duration of one versus another formulation. We did report mean number of doses received by the injectable vitamin D group and mean number of doses according to serum levels of PTH at the time of starting this medication. This latter analysis demonstrated that patients with higher levels of PTH received more frequent injections than patients with lower levels of PTH, as would be expected. It is interesting that the survival benefit associated with injectable vitamin D was greatest within the highest quintile of PTH (Figure 1), the group that received the highest frequency of doses, suggesting a potential dose-response effect or suggesting that this was the group that benefited most from vitamin D. One must interpret these correlations cautiously, because these estimates represented mean doses given only while undergoing hemodialysis therapy in an outpatient hemodialysis facility. We were unable to obtain precise information on injectable vitamin D status during hospitalizations (these patients are frequently hospitalized); therefore, assigning any dose-response effect on the basis of frequency as we have done may be inaccurate. Third, we did not account for other therapies such as oral medications, including oral vitamin D and oral phosphate binders. Typically, patients who receive injectable vitamin D during chronic hemodialysis stop taking oral formulations, but if patients in the non–vitamin D group were taking oral vitamin D, we still observed significant survival differences between the two groups. Therefore, we do not believe that oral vitamin D affected our results, and potentially our results may have been underestimated if a large portion of the non–vitamin D group were actually taking oral vitamin D. Finally, during the initial period included in this study, 1996 to 1999, the primary oral phosphate binders were calcium based; therefore, the contribution of alternative non–calcium-based oral phosphate binders was likely minimal (22). In this historical cohort study, hemodialysis patients in the group that received injectable vitamin D seemed to be at a survival advantage compared with patients in the group that did not. The survival benefit was evident at all levels of serum calcium, phosphorus, or PTH. Given that active vitamin D has biologic effects well beyond mineral and PTH metabolism, these “nontraditional” effects of active vitamin D should be the focus of further animal and human studies. Furthermore, studies to examine the consequences of altered mineral metabolism and/or altered levels of PTH should consider the potential contribution of active vitamin D in their results. We acknowledge that in this observational study of a therapeutic agent we cannot completely exclude sources of bias or residual confounding, despite our extensive analyses. In addition, we were unable to examine a dose-response effect with a great degree of precision. For these reasons, the results of this study should be confirmed before definitive therapeutic decisions are made. Confirmation should come by way of observational studies and randomized trials, the latter targeting both patients who do and do not meet the current recommendations for receiving injectable vitamin D (5), and addressing the optimal dose that potentially confers a survival benefit. We thank Dr. Gary Curhan for assistance and advice. Is Nutritional Vitamin D Supplementation Beneficial in Dialysis Patients? Selective Knockout of the Vitamin D Receptor in the Heart Results in Cardiac Hypertrophy: Is the Heart a Drugable Target for Vitamin D Receptor Agonists? Vitamin D and Cardiovascular Disease: Will It Live Up to its Hype?